Flexible Engineer Grade & High Intensity Grade Reflective Vinyl Rolls. Tractor Trailer DOT-C2 Prismatic Grade Reflective Conspicuity Tape Rolls. carry reflective raised pavement / road markers. 7 Year Flexible Engineer Grade (ELG) ASTM D4956 Type-I Reflective Vinyl Rolls. Adheres well to smooth, hard surfaces. Flexible material. Works well for all purposes including vehicle striping. This is the most common reflective tape. Used on speed limit signs, yield signs, fire trucks, etc... Approximately 75 Candlepower. Comparable in brightness to a speed limit sign or a car tag. Engineer Grade Pre-Striped Reflective Barricade Tape. ASTM D4956 Type-I Reflective Vinyl Rolls. The white has a mild greyish appearance in the daytime and reflects white at night. Used in a wide variety of applications from barricades to vehicle conspicuity striping. Available in right or left slant, and an orange/white or red/white configuration. (Slant is from bottom to top.) Approximately 75 Candlepower. High Intensity Grade (ULG) ASTM D4956 Type-III Reflective Vinyl Rolls. Acrylic Topcoat. Adheres well to smooth, hard surfaces. Works well for all purposes including vehicle striping. 3-4 times brighter than engineer grade tape. Approximately 250 Candlepower. Hi Intensity Grade Pre-Striped Reflective Barricade Tape. ASTM D4956 Type-III Reflective Vinyl Rolls. Available in Red/White and Orange/White. 6" wide stripe configurations. The white has a slightly greyish honeycomb appearance in the daytime but reflects white at night. Used in a wide variety of applications from barricades to vehicle conspicuity striping. Approximately 250 Candlepower. DOT Reflective Road Barrel Tape. Approximately 250 Candlepower. Prismatic Grade Reflective Tape Reflextive V92 and V82(Type 5). ASTM D4956 Very Bright Reflective Vinyl Rolls. Brightest grade of tape. Prismatic design. High Angle of Reflecivity. Approximately 800 Candlepower (white). Prismatic Grade Yellow School Bus Reflective Tape . ASTM D4956 Reflective Vinyl Rolls. Brightest grade of tape. Prismatic design. High Angle of Reflecivity. Tractor Trailer DOT-C2 Prismatic Grade Reflective Conspicuity Tape Rolls. Very Bright Prismatic Reflective. Very Bright. High Angle of Visibility. Strong Adhesive. Up to 600 Candlepower (white). 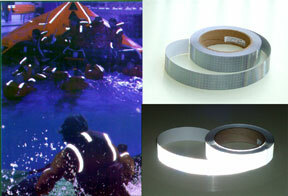 SOLAS Coast Guard Approved Marine Grade Reflective Tape Rolls . Prismatic Reflective. Brightest Tape and Strongest Adhesive. Performs best on hard surfaces but will adhere to cloth surfaces such as life preservers or zodiacs. Approximately 900+ Candlepower. Prismatic Grade Rail Car Tape. Very bright like a diamond or crystal grade tape. Reflexite R99 Rail Car reflective tape is FRA approved and carries the FRA logo. It is specifically designed to improve the night time visibility of railroad cars. It uses micro-prismatic lenses to reflect light and will adhere to a wide variety of surfaces. Our rolls are kiss-cut into standard 18" lengths for easy application. Rated for an outdoor life of ten years. 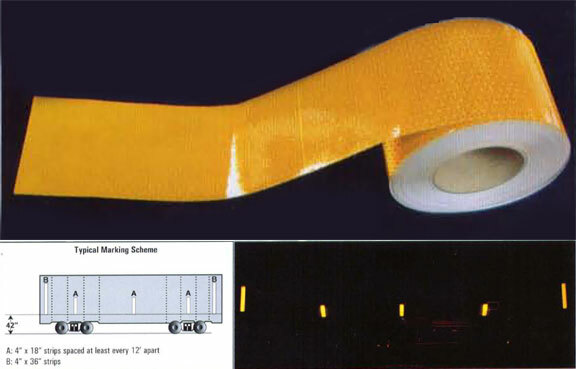 R99 railroad conspicuity tape can also be applied to school buses, vehicles, industrial equipment, bollards and any other items where night time visibility is a requirement. Exceeds FRA reflectivity requirements. Reflective Traffic Cone Collars. Self Adhesive, Wrap Around Design. High Intensity ULG material. Approximately 250+ Candlepower. Available in 6" upper or 4" lower sizes for 18",28" & 36" cones. 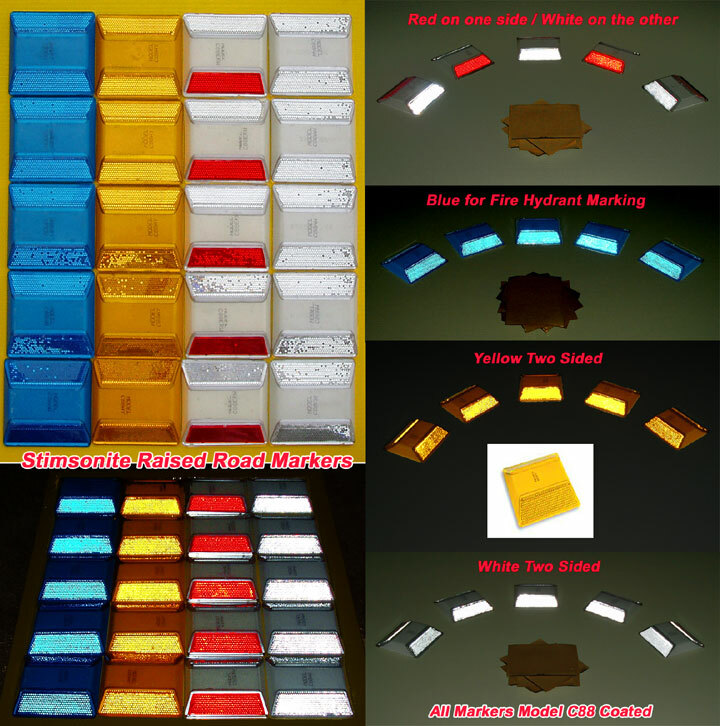 Reflective Raised Pavement / Road Markers. Available in blue,yellow,white and white/red. Reflective from both directions. Can be purchased with or without an adhesive butyl double sided pad. Very easy to install. Copyright 2007 - Reflective Inc.